Ultrasound can be used to image the diaphragm when there is little or no air intervening between the probe and the muscle. The normal diaphragm, in common with other skeletal muscles, is poorly echogenic and identification depends on bright echoes reflected from the attached parietal pleural and peritoneal membranes (13); a further, less bright and irregular echo may be visible, arising from the layer of connective tissue and vessels running through the middle of the muscle (14). Dome movement. Ultrasound has been used to monitor displacement of the dome of the diaphragm during respiratory maneuvers, with craniocaudal excursions of the posterior dome measured either with a transducer on the lateral chest wall (15) or with a probe placed on the upper abdomen and directed toward the dome (16, 17). Visualization of the right dome is usually better than the left because of the underlying liver, in contrast to the gastric and intestinal gas adjacent to the left dome. Diaphragm displacement measured by these techniques compares favorably with simultaneous fluoroscopic estimates (18), but the diaphragm is shown as a brightly echogenic arc with poorly defined borders whose thickness can be as much as 10 mm; the pleural and peritoneal membranes cannot be distinguished. In this application a 3.5-MHz vector transducer with considerable penetration but lower resolution is used in the time-motion mode (M-mode). Zone of apposition. Ultrasound has also been used to assess the length and thickness of the zone of apposition against the rib cage; although dynamic changes in length can be assessed by fluoroscopy (19) this entails considerable radiation exposure. Most of the more recent ultrasound studies have concentrated on this application; because the costal part of the diaphragm is relatively close to the skin surface, it is possible to use a 7.5- or 15-MHz transducer, which has less penetration but superior resolution. High-resolution M-mode ultrasound has been used during tidal breathing (20); with two-dimensional (B-mode) ultrasound the two outer echogenic layers of parietal pleura and peritoneum can be clearly visualized (14) (Figure 2). In these applications a small ultrasound transducer is held firmly in a lower intercostal space in the mid- or anterior axillary line (usually on the right side) perpendicular to the chest wall; if the angle of incidence changes significantly from perpendicular, resolution is lost. The measurement is rapid and shows good repeatability in most subjects, but may be difficult in obese individuals. With this technique the thickness of the zone of apposition during relaxation at different lung volumes (14, 21), tidal breathing (20), and static inspiratory efforts (14) has been measured. Because the diaphragm is identified by its enveloping membranes and there is scattering, ultrasound tends to overestimate diaphragm thickness. However, estimates of the average thickness of the costal diaphragm in normal untrained subjects during relaxation at FRC have been in the range of 1.7-3.3 mm (14, 20, 22-24), with larger values in men than women (22), and lower values in children (24, 25). Healthy newborn infants have also been studied (26). There appears to be a thicker diaphragm in individuals with greater inspiratory strength (27). Unilateral diaphragm paralysis is associated with a thinner costal diaphragm (28), and Duchenne muscular dystrophy is associated with increased echogenicity (25). Most measurements have been made in the right anterior axillary line and little is known about variations in thickness at different sites in the zone of apposition. Diaphragm thickening with increasing lung volume should be inversely proportional to reduction in length; the thickening found as lung volume is increased (14, 21) is compatible with this relationship, but thickening during tidal breathing (20, 29) and maximal inspiratory efforts (14) has been greater than anticipated from the expected shortening. Whether this is an artifact or is caused by enhanced thickening close to diaphragm insertions into the ribs (as has been shown in dogs) is not yet known. Figure 2. B-mode ultrasono-gram of the normal diaphragm in the zone of apposition (between the two arrows) visualized through a lower right intercostal space. Scale division on x and y axis is 10 mm. Reprinted by permission from Reference 14. Definition of abbreviations: P-A = postero-anterior; RV = residual volume; TLC = total lung capacity. Potential further applications include the simple assessment of diaphragm involvement in neuropathy (30) and myopathy, severe acute illness, after cardiothoracic surgery (31), and changes with rehabilitation and training programs (32). Skeletal muscle mass is related to force generation. The muscular cross-sectional area of the diaphragm in the zone of apposition has been estimated from measurements of the internal circumference of the lower rib cage and measurements of diaphragm thickness (27). Ultrasound has also been used to detect displacement of the upper border of the zone of apposition of the costal diaphragm to the rib cage when lung volume changed (8); this makes use of the loss of diaphragm echo complex, because of the intervention of aerated lung as lung volume increases. 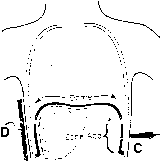 The length of the zone of apposition can also be estimated by identifying the rib into which the diaphragm is inserted and/or measuring its upper border at total lung capacity (19). In this application a longer ultrasound probe is placed craniocaudally across several ribs and intercostal spaces (again perpendicular to the chest wall), usually in the anterior axillary line; because the probe cannot be placed so close to the diaphragm and the image is lost beneath the ribs, resolution usually is less good with this technique. Other respiratory muscles. Intercostal muscles, parasternal (33) (and cervical inspiratory) muscles, as well as abdominal muscles (34-36), which are difficult to image by other techniques, can all be imaged with ultrasound, reliance being placed on echoes from the surrounding fascia. If the relationship between thickness and shortening were known, ultrasound could be used to assess the pattern of intercostal and abdominal muscle contraction during breathing maneuvers. Ultrasound imaging of these muscles (and the diaphragm) is useful in the accurate placement of intramuscular electrodes to record electrical activity (28).